Finding the best cold weather hunting boots is essential for a wholesome hunting experience. As an experienced hunter you will agree that while accessories may add to your hunting experience, no single item makes for a great hunt. If you are focusing all your attention on getting the best rifle, forget about something trivial – boots can make or break your hunt. In most hunts, you have to keep moving to find your prey. You have to cross rocky terrain, hills, marshes. No rifle will help you when your feet are sore, and you can’t go on, or you’re getting cold. But there’s a way out of this. Choose your hunting boots with care, and your hunt will be successful. How to Choose the Best Cold Weather Hunting Boots? Looking for the perfect winter hunting boot is never easy. There are so many considerations while making your choice. The cost of a mistake is rather high. You can’t test how your hunting snow boots perform unless you actually go out and hunt. This life lesson may be too expensive to afford. We have gathered lots of experience in winter hunting to pass that knowledge to you. This is what you should look for in extreme cold weather hunting boots. We’ve looked into the features and compared many designs in the market, read this guide to learn what makes good winter hunting boots. Not all hunting activities are created equal, and not all boots were either. You can buy the best high-end hunting boots, but it won’t mean much if you use them in the wrong situation. Some hunters are active and walk a lot while looking for prey. This makes them sweat, especially if they walk fast to chase after the game. In winter, wet feet means cold feet. If you are this kind of hunter, look for lightweight boots with up to 30 oz. of insulation. 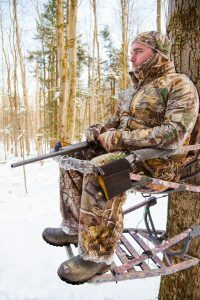 If you prefer waiting for the game to appear, look for the warmest hunting boots for sitting in a tree stand. They are heavier than walking boots and sport up to 35 oz. of insulation. The best waterproof hunting boots do not use cheap or poorly made materials. However, each material offers its benefits and downsides that should be considered. The obvious choice is leather. The best leather hunting boots are waterproof and keep your feet dry. They normally have a rubber outsole because it is lightweight and doesn’t make a sound as you walk. The downside is that leather boots can be heavy for some. The warmest winter rubber boots will keep your feet warm and tend to weigh a lot less than leather. Compared to leather boots, their enhanced water resistant abilities means they are not as breathable. The very first thing to think of when choosing a winter boot is the insulation which can make or break any hunt. Too little and your feet are cold, while too much and they’re wet. In the end, what matters is what do you want to put your boots through. The best uninsulated hunting boots have up to 7 oz. of insulation. They are ideal for activities that include hiking and running where cold temperatures are not a factor. The best insulated hunting boots range from 7-35 oz. of insulation. Anything under 28 oz. 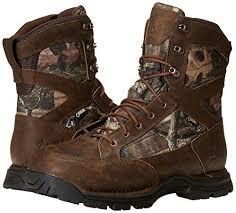 is considered lightweight insulated hunting boots. These will be useful in most situations. Go for over 28 oz only if you plan to sit or stand a lot. It is a recommended choice for ice fishing and tree stand hunting. One slip in the forest can lead to a serious injury. If it doesn’t, that elk you’ve been tracking for hours will hear your fall and run away. Look for boots with multi-directional traction to avoid this. Use each boot where it is designed for. Lace-up hunting boots perform best on a rocky terrain. 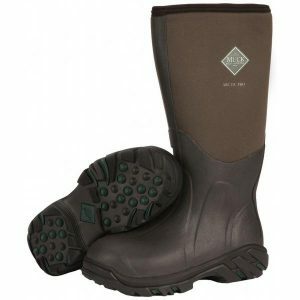 The best men’s rubber hunting boots are perfect for walks in marshland or crossing shallow rivers. You can’t feel the most comfortable hunting boot. The boots fit like a warm hug or a handshake. When you wear them, the boots should not squeeze your feet to the point of discomfort. Comfortable hunting boots are easy to take off and support your ankle well. This prevents injuries and makes sure nothing is distracting you from the hunt. Some imported boots run small. Check before you buy and adjust the size to the one that’ll suit your feet. Most footwear, domestic and international will have a size in centimeters on the tag, this is a good indicator when purchasing imports which may slightly differ in size. Even if you can bear the weight of most boots on your feet, there is a limit. The best lightweight hunting boots not only keep your feet warm but allow you to walk faster and further. No one wants to abandon easy prey and walk back to camp because you grew too tired. Look for the ideal combination of insulation and weight to avoid missing out on the big game. Pro tip: some traction designs can pick up mud, making the boot heavier. Pay attention to this before buying. Good waterproof hunting boots are not cheap. They have to be durable within reason to the price. Sure, you’re not going to use them on the red carpet, but how much abuse they can take is important to know. Some boots are great overall but will fail if you try bushwhacking through rough terrain. Consider where you’ll be using them and look for a balance of durability and performance if you want to choose good hunting boots. 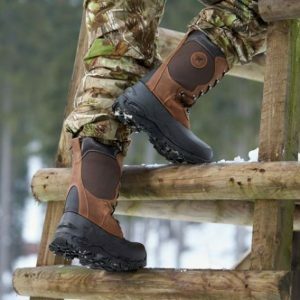 There are many cases where you’ll find yourself hunting in cold weather conditions, and if so, you need the best hunting boots for cold weather. They’ll keep your feet dry, warm, and comfortable, but finding these boots isn’t a quick task. 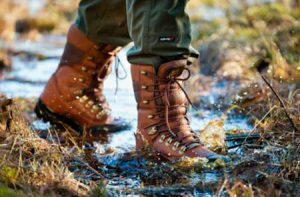 To help you, we’ve reviewed 10 top-selling boots as well as offer an extensive FAQ to learn more about these boots. Kamik Men’s Hunter Boot utilizes synthetic material to create a durable boot that not only resists water, but acid and oil as well. As extreme cold weather hunting boots, the two-layer system wicks moisture away while also locking in heat. They’re a good height to keep slush and water out so you can wade through streams as you hunt. 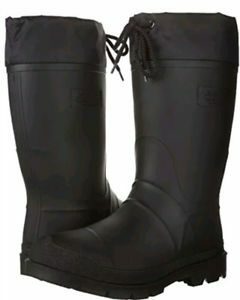 Made from synthetic rubber with nylon upper, this boot features a thermal guard liner that’s removable for warmth, and both the rubber and nylon collars are waterproof. Kamik Men’s Hunter Boot offers a thermal guard liner that traps in heat to keep your feet warm while also providing waterproof protection. Bogs Men’s Classic High No Handle Winter Snow Boot is another forerunner for the best winter hunting boot title due to quality insulation alongside ideal support. These stretch and contour to offer comfort alongside a secure fit so there’s no worry about them slipping. They’re non-slip as well so you can feel safe while out on the field. The rubber used is durable for long-lasting wear, and it features a four-way stretch Neo-Tech insulation, self-cleaning and non-slip outsole, and protection from water. Bogs Men’s Classic High No Handle Winter Snow Boot offers a comfortable, snug fit, four-way stretch insulation, and non-slip protection. MuckBoots Men’s Arctic Pro Hunting Boot are quality hunting boots for cold weather as they offer a custom fit against the leg to lock in heat. There’s a fleece lining as well for added warmth protection. For more comfort, there’s an EVA molded midsole and contoured footbed. This features double reinforcement for comfort and stability while offering enhanced grip for traction, and thermal foam underlay along with fleece lining for warmth. MuckBoots Men’s Arctic Pro Hunting Boot is designed with optimal reinforcement for support while offering grip for deep snow traction and fleece lining for warmth. LaCrosse Men’s Alphaburly Pro 18″ 1600G Hunting Boot has a full neoprene gusset on the back in order to accommodate various calf sizes. This also makes it easier to slide the boot on and tuck in your pants, a useful feature for wading through water. As cold weather hunting boots, the insulation wraps around the foot for thorough protection. The rubber offers flexibility while the neoprene provides a more comfortable fit; in addition, it wicks moisture to keep feet dry. 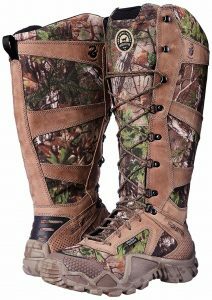 LaCrosse Men’s Alphaburly Pro 18″ 1600G Hunting Boot features Thinsulate insulation to keep feet warm while offering a non-slip tread to keep you safe. 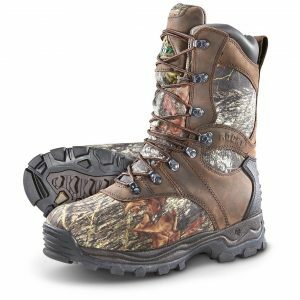 Irish Setter Men’s 2875 Vaprtrek Waterproof 17″ Hunting Boot offers various traction to support downhill use as well as providing traction for heel strikes. They’re comfortable hunting boots thanks to their lightweight design and UltraDry construction. The Irish Setter cold weather boots also provide a waterproof lining. These have minimal insulation, but the SnakeGuard construction is durable and thick enough to offer some warmth, while the abrasion-resistant panels fight off scratches and angled lugs prevent slips. Irish Setter Men’s 2875 Vaprtrek Waterproof 17″ Hunting Boot has a rugged design with tremendous traction for downhill use as well as a waterproof and moisture-wicking lining. 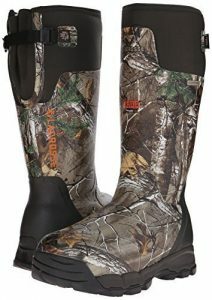 Danner Men’s Pronghorn Realtree Xtra 1200G Hunting Boot has 100% waterproof and breathable construction to keep you dry. In addition, there’s a cushioned insole for support. When searching for first-hand accounts for the Danner hunting boots review, we discovered there’s also ideal insulation that traps in warmth while you move. Made from breathable and waterproof materials, these are light in weight, has a supportive platform, and traction for rugged terrain. Danner Men’s Pronghorn Realtree Xtra 1200G Hunting Boot is lightweight and features tough traction for rough terrain as well as waterproof protection. Northside Men’s Renegade 400 Waterproof Insulated Hunting Boot is good hunting boots for keeping out debris thanks to the padded collar as well as the gusseted tongue. They have a compression molded EVA midsoles for cushioning as well as waterproof seams. There’s also resistance against wet, snowy, and icy conditions. Designed from leather and synthetic material, it features a waterproof seam construction as well as gusseted tongue and a padded collar in addition to traction and shock-absorption. Northside Men’s Renegade 400 Waterproof Insulated Hunting Boot are lightweight insulated hunting boots that resistant abrasions, offer a waterproof seam, and padded collar. 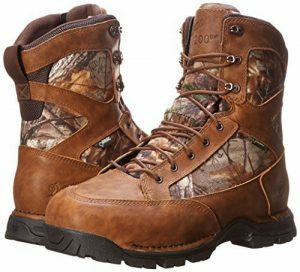 Rocky Men’s Sport Utility Pro Hunting Boot is popular hunting boots due in large part to their lightweight design that offers toe box room without coming across as bulky. There’s traction for stability across multiple terrains as well. The molded midsole keeps your feet comfortable all day long. 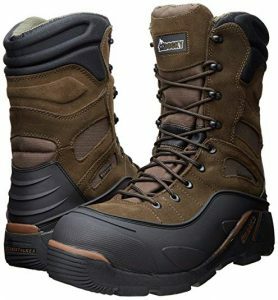 The leather and nylon construction offers durability as well as waterproof protection, and the unique outsole provides safety walking on various terrains. 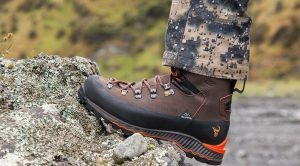 Rocky Men’s Sport Utility Pro Hunting Boot provides insulation and waterproof capabilities in a lightweight construction. As high-end hunting boots, the Danner Men’s Pronghorn 8″ 400G Hunting Boot uses GORE-TEX linings for waterproof protection. There are three-density Ortholite footbeds that offer both comforts as well as help keep feet dry. In addition, there’s protective toe and heel caps and traction for rugged terrain. This features GORE-TEX waterproof lining and protection that keeps feet dry while the full-grain leather and nylon upper further protects your feet along with the 400g insulation. Danner Men’s Pronghorn 8″ 400G Hunting Boot combines comfort, stability, and warmth for an easy-to-wear hunting boot. Rocky Men’s Blizzard Stalker Pro Mobu Hunting Boot features waterproof construction to keep your feet dry. As hunting boots for cold weather, there’s 1200g of Thinsulate insulation. Alongside that, they grip well on uneven or snow-covered terrain. Offering rugged construction, these feature a foam-padded collar for comfort and a secure fit as well as 1200g insulation and waterproof capabilities. Rocky Men’s Blizzard Stalker Pro Mobu Hunting Boot is built to last and features good grip, stability, and insulation along with waterproof protection. 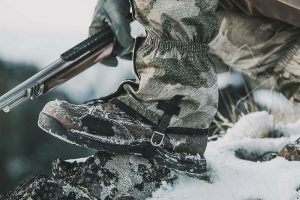 If you still have some questions and concerns about finding the best warm hunting boots, check out our brief FAQ below that addresses the most common issues. How many grams of insulation do I need for hunting boots? Generally speaking, the higher the grams, the more protection that is offered. At the same time, select the grams based on the weather condition you know you’ll be hunting in. For instance, you can find the best-insulated hunting boots with 600g as well as 1200g if you know you’ll be in cold conditions, not outright freezing conditions. Lightweight insulated hunting boots are better off for simply chilly or slight windy conditions. These tend to be around 200g and intended for if you’re constantly on the move. How do I keep my feet warm while hunting? There are many ways to keep feet warm beyond having the warmest winter rubber boots. One way is to add on a pair of warm, wool socks. Be sure there’s enough room in your boots for this, and it pays to have moisture-wicking properties as well in the event you sweat. In addition, shop for boots according to the temperature you know you’ll be in. Some boots work better for average chilly weather while others are more heavy duty and intended for harsher conditions. If your feet still feel cold even with thick socks, consider finding boots with a heavier rated insulation. How do you size hunting boots? Properly sizing your hunting boots will ensure not just comfort, but also your security while you’re out in the field, woods, etc. The main thing to keep in mind is that one size from a specific brand isn’t always the same as another brand. So, check if the boots you’re interested in tend to run larger or smaller than their stated sizes. Good hunting boots will mold to your feet for a comfortable, secure fit. If you’re someone who requires more support, focus on how adequate the footbed is. Also, keep in mind that your feet will swell by the end of your day, so focus on the toe box room and opt for something wider just in case. What is the best insulated rubber hunting boot? Choosing the best insulated rubber hunting boots can be relatively subjective considering you may have different requirements than someone else. However, to generalize things, a rating such as 2400 gram Thinsulate rubber hunting boots is a top choice. As mentioned previously, the higher the grams, the greater the insulation. At 2400 grams, you’re more on the heavy-duty side of the insulation, preferable for extreme cold weather. Quality ones are able to utilize the Thinsulate feature without adding much bulk so that they’re as easy to wear as they are warm. To wrap up our reviews, we recommend the Kamik Men’s Hunter Boot to be the best cold weather hunting boots you can wear. 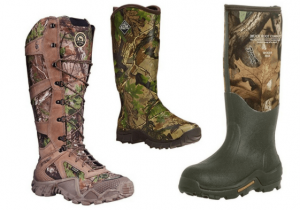 They lock in heat, offer a watertight fit, and keep your feet dry so you can hunt in various elements and conditions. Bogs Men’s Classic High No Handle Winter Snow Boot: Four-way stretch insulation and non-slip sole. 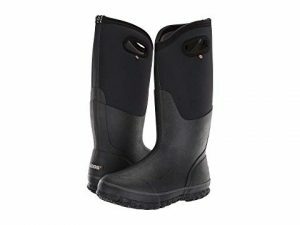 MuckBoots Men’s Arctic Pro Hunting Boot: Deep snow traction and fleece-lining warmth. 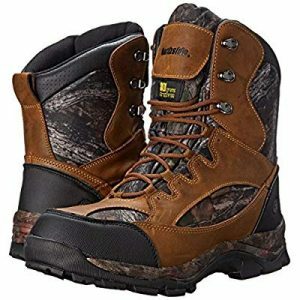 LaCrosse Men’s Alphaburly Pro 18″ 1600G Hunting Boot: Thinsulate insulation and unique tread design. Irish Setter Men’s 2875 Vaprtrek Waterproof 17″ Hunting Boot: Good traction and resistant to abrasions. Danner Men’s Pronghorn Realtree Xtra 1200G Hunting Boot: Waterproof and traction for rough terrain. Northside Men’s Renegade 400 Waterproof Insulated Hunting Boot: Abrasion-resistant and waterproof seam construction. Rocky Men’s Sport Utility Pro Hunting Boot: Warm with a sturdy design and ideal traction. Danner Men’s Pronghorn 8″ 400G Hunting Boot: GORE-TEX technology and terrain protection. Rocky Men’s Blizzard Stalker Pro Mobu Hunting Boot: 1200g insulation and molded foam padded collar.